Following up on the Perfect 7-Day Itinerary for Zion and Bryce Canyon National Parks, here is a week’s itinerary for the eastern parks, which are closest to Salt Lake City. It is very easy to merge these itineraries into one two-week adventure with starting points in either city. Or, if you want to get creative, find nearby towns such as Grand Junction, which is only a two-hour drive to Moab. As with the western parks, the best times of the year to go are spring and fall to avoid the summer crowds and heat or the chilly winter temperatures, though the parks can be beautiful with a dusting of snow. Capitol Reef National Park. Photo by Denis LeBlanc. 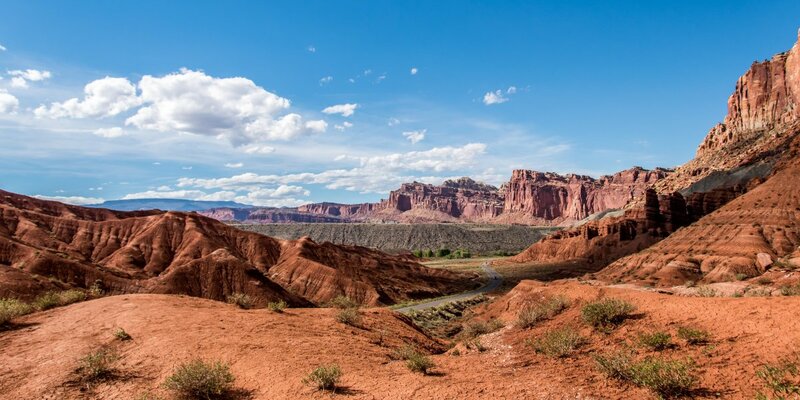 Travel to Capitol Reef National Park, the least-visited of Utah’s national parks. Least-visited does not mean inferior, as Capitol Reef has spectacular scenery, great hikes, and the best campground, Fruita Campground, of all the parks on these itineraries. If time permits on the first day, head to Panorama Point for a great sunset. Make sure to buy some pies at the Gifford Homestead gift shop near the campground. They are made locally in Torrey and support the park; they are also delicious! With several hikes to choose from, you cannot go wrong with any one or two of the main trails: Navajo Knobs, Chimney Rock, Cohab Canyon or Cassidy Arch. The latter is great in mid-afternoon, and the drive back to Fruita on the park scenic drive near sunset is not to be missed. If there is an extra day that can be added to the trip and a four-wheel drive vehicle is available and no rain is expected, the all-day adventure to Cathedral Valley is a once-in-a-lifetime journey. Heading out from Capitol Reef, hopefully after a pie for breakfast, it is a short drive to Goblin Valley State Park. A favorite with kids, this park has a very accessible field of odd-shaped rocks that look like visitors from another planet. It is easy to spend a half day here exploring the “goblins.” The campground at Goblin Valley is spartan but incredibly scenic. If there is still time in the afternoon, drive about 5 miles west of the park to the Little Wild Horse Canyon on BLM land. This is a wonderful slot canyon that can be hiked out-and-back for 3 to 4 miles to get the best of the narrows or combined with Bell Canyon for an 8-mile loop. A view near Dead Horse Point State Park Campground. Photo by Denis LeBlanc. Head east to the funky town of Moab and the two beautiful national parks that are bookends to the town. The best campground for Canyonlands National Park is actually in Dead Horse Point State Park, just outside of and overlooking Canyonlands. Arguably the best view in Utah, Dead Horse Point is spectacular. 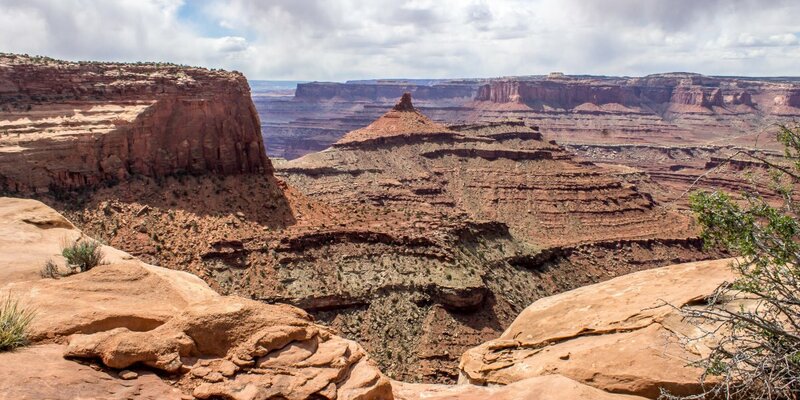 Spend the afternoon hiking the flat 6-mile Rim Trail around Dead Horse Point. Sunset at any of the overlooks is usually spectacular. In the morning, head into Canyonlands National Park and drive to the end of the road at Grandview Point. On the way back take the little-known and unmarked hike to the False Kiva viewpoint. Late afternoon can be spectacular there, and if the sunset is good, stop at the Green River Overlook on the way back for great views. Head across the highway to Devils Garden Campground in Arches National Park (make sure you stop at the visitor center on the way to book a Fiery Furnace ranger tour for the next day. The quick loop trail to Broken Arch from the campground is a great early-morning hike. If you were able to get a Fiery Furnace tour, this will take up the middle part of the day. This is an area of the park only available (with some exceptions) to people with a ranger guide. Getting lost in there is a real possibility. The Fiery Furnace is ironically one of the coolest spots in the park, so it is a good mid-day adventure. Visit the Windows area of the park in the afternoon, and take the moderate hike out to Delicate Arch for the sunset. The last day means heading back to Salt Lake City. On the way out of Arches, stop and explore Park Avenue and the other monuments near the exit of the park. These are particularly beautiful in early and mid-morning. All of the campgrounds on this itinerary take reservations several months in advance, and this is always a good idea as these parks are very popular. The national parks are an important part of the spectacular scenery of southern Utah, but by no means are they the only worthwhile destinations. If you’ve enjoyed visiting the major parks, put these other destinations on your bucket list: Cedar Mesa and Natural Bridges National Monument, the Highway 12 Scenic Byway and Lower Calf Creek Falls, Horseshoe Canyon (the finest prehistoric rock art in North America), and many, many more. Denis - Thanks for the great insight into the area. We are heading that way for Spring Break with two kids (9 & 12). We have a pop-up and/or tents to bring but wondering about the temps the last weekend in March through the first week of April (Hauling the pop-up from western Montana). So we are contemplating camping vs. local lodging.